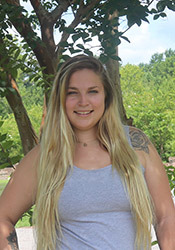 Originally from New Jersey, Julie's passion is the sciences, and she came to South Carolina to study biology at Coastal Carolina University. Here in the office, she's our Administrative Assistant, making sure that all of our paperwork is filed, our boxes are ticked, and the whole operation keeps running in tip-top order. This means no surprises for us, or for our customers.